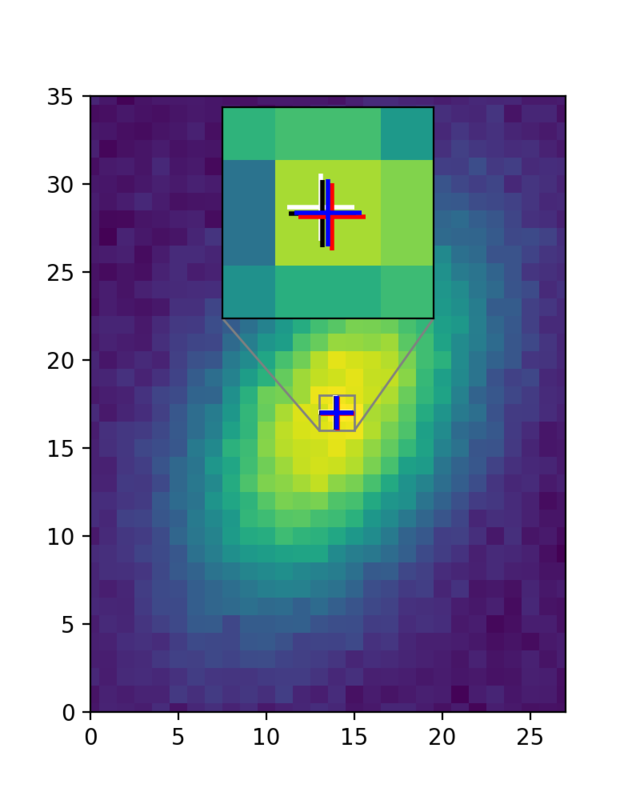 centroid_com(): Calculates the object “center of mass” from 2D image moments. centroid_1dg(): Calculates the centroid by fitting 1D Gaussians to the marginal x and y distributions of the data. centroid_2dg(): Calculates the centroid by fitting a 2D Gaussian to the 2D distribution of the data. Masks can be input into each of these functions to mask bad pixels. Error arrays can be input into the two fitting methods to weight the fits. ms, mew = 30, 2. This subpackage contains tools for centroiding objects in an astronomical image. centroid_1dg(data[, error, mask]) Calculate the centroid of a 2D array by fitting 1D Gaussians to the marginal x and y distributions of the array. centroid_2dg(data[, error, mask]) Calculate the centroid of a 2D array by fitting a 2D Gaussian (plus a constant) to the array. centroid_com(data[, mask]) Calculate the centroid of an n-dimensional array as its “center of mass” determined from moments. centroid_sources(data, xpos, ypos[, …]) Calculate the centroid of sources at the defined positions. fit_2dgaussian(data[, error, mask]) Fit a 2D Gaussian plus a constant to a 2D image. gaussian1d_moments(data[, mask]) Estimate 1D Gaussian parameters from the moments of 1D data. GaussianConst2D([constant, amplitude, …]) A model for a 2D Gaussian plus a constant.